The Tea Tree Gully Redbacks are a concert and marching band based in the north eastern area of Adelaide. Growing from humble beginnings as a youth band in 1995, the band has become one of the leading community marching bands in South Australia. The band is renowned for its choreographed marching displays incorporating dance steps and singing. The Redbacks regularly perform at a variety of events, ranging from pageants and parades to cabarets and private functions, with a repertoire that includes classic rock and pop songs, as well as traditional marches and concert pieces. 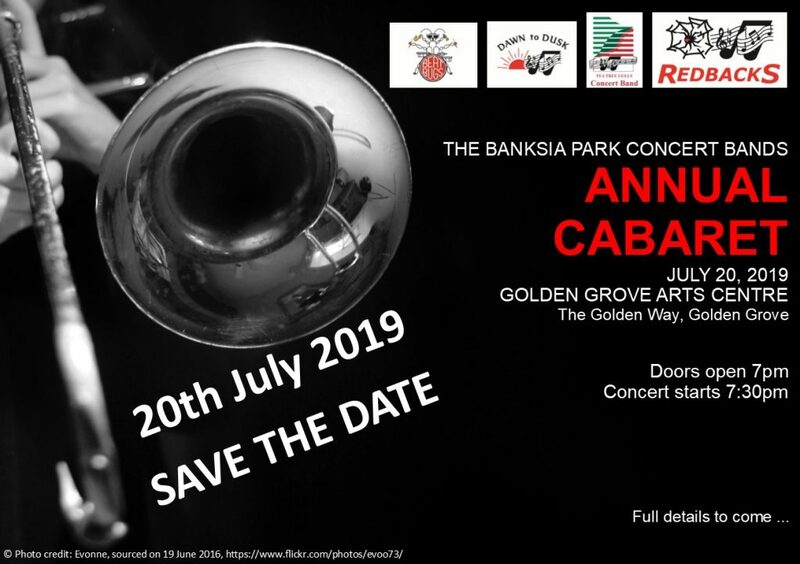 Some of the band’s regular performances include the Royal Adelaide Show, Credit Union Christmas Pageant, ANZAC Day commemorations and the band’s very own Banksia Park Concert Bands Cabaret. The Redbacks are available to play at events, as a marching band, concert band, big band or clarinet ensemble. If you are interested in booking the band, please contact us. If you play an instrument, and want to join an exciting and highly respected concert and marching band, why not join the Redbacks? The Redbacks regularly audition new members for the woodwind, brass and percussion sections.